Laser Fountains | Laser Spectacles, Inc.
What is a “Laser Fountain”? 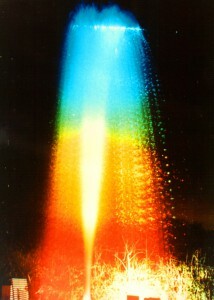 A “Laser Fountain” is a creation in which water is the medium used to make the laser beams visible. Using various types of fountains available, a wide variety of effects can be achieved. 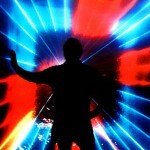 Graphics, as well as beam effects, can be created using laser fountains, so a complete show can be designed around them. This is useful when designing a laser show around a natural water feature such as a lake or pond. Laser Spectacles is fortunate to have here in San Marcos one of the world’s premiere fountain manufacturers – The Fountain People. The following pictures and information were developed in conjunction with The Fountain People. ountains scatter the laser light like miniature lenses. A wide variety of effects can be achieved using laser fountains. Varying the placement of the lasers relative to the fountains gives an unlimited number of visual and spatial designs. “Stream” — a single point source of water pressure, holding together (not breaking up into drops). An unadorned garden hose is a stream source. “Sheet” — a linear source of water. Rather than being simply a point, the source of water has the dimension of length so that the water emanates as a sheet, like a sheet of paper. “Spray” — a point source of water in which the water is forced under pressure into some kind of nozzle that breaks it up into multiple drops or droplets. “Fog” — a spray that is fine enough to float suspended in air. “Flower” — multiple streams of water emanating at different angles from a central point. “Tower” — a column of water shooting straight up. Heights can vary from a few inches to 100 feet. “Waterfall” — streams and/or sheets of water cascading from a source down into a pool. 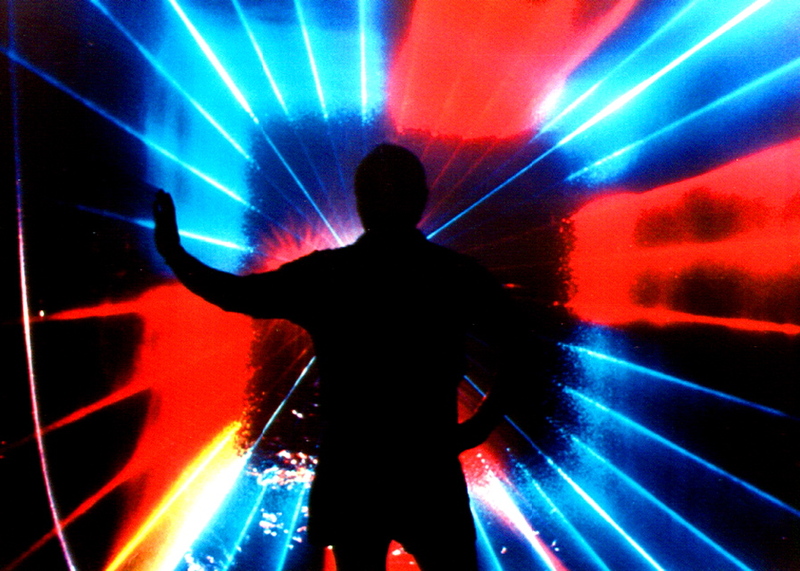 “Screen” — a 180° spray of water designed to be as thin as possible in order to allow laser or film projection to form a graphic image. Air is the main fountain modifier. The basic effects listed above can all be modified by “aeration”, in which air is mixed with the water as it leaves the fountain nozzle. This introduces a “foamy” effect and makes the water more reflective of laser beams. 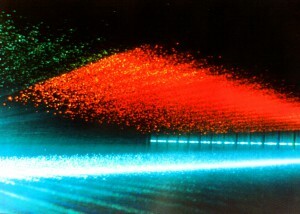 Creative use of aeration is one of the keys to producing brilliant and colorful laser fountains. In the outdoors, air affects the fountains by means of the wind. The wind can introduce”aeration” of its own, and a strong wind can cause certain fountain effects to “bend”. The show controller in such a situation should have a live interaction capability that allows an operator to keep the fountains and lasers perfectly meshed. Water pressure is another fountain modifier. Obviously, modifying the water pressure will change the height of a fountain effect. There are more subtle effects that occur with changing the water pressure quickly over time. 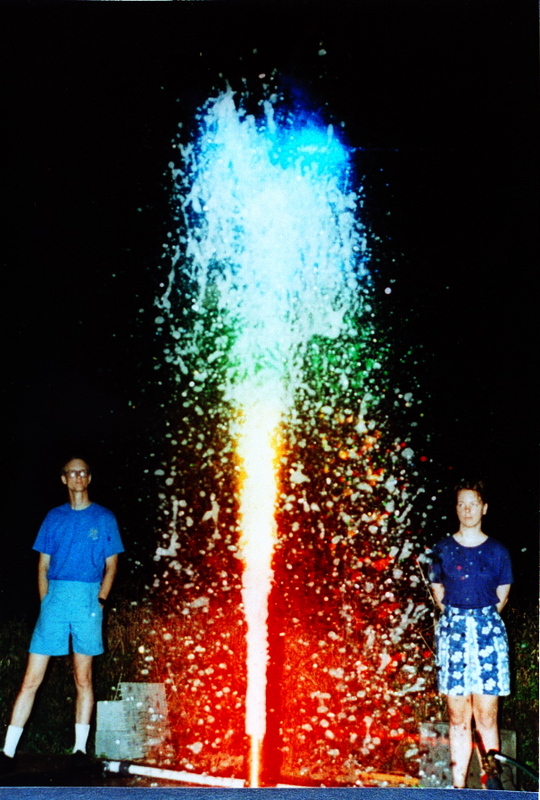 Laser Spectacles, Inc. controls both aspects of laser fountains, the laser show and the fountains, by means of the Lasergraph DSP computer, and its Peripheral Interface Cards. With the DSP it is simple to control all aspects of laser fountains, from positioning and creation of laser effects, to directing and modulating waterflow to the fountains. Audio can easily be integrated via SMPTE or MIDI timecode. The system can integrate with other types of lighting by means of a DMX-512 interface. Safety Regulations – In the USA, the FDA regulates the placement of laser beams to 3 meters above the surface that the audience is standing upon, and 2.5 meters laterally from the audience. Brightness – Maximum brilliance is achieved when laser fountains are lit from the rear (backlit) relative to the audience. And, since this is an effect requiring darkness for a background, the ambient light levels at performances should be taken into consideration when specifying the size lasers to be used. Audience Comfort – The audience should not get wet! However, in some places this may be a desired part of the effect, such as water parks. While laser fountain installations must be designed and bid individually, a typical budget for an effective and comprehensive laser fountain show is $150,000.